With water shooting between 75-220 feet (23-67 m) high and an eruption that lasts from one to two hours, Great Fountain is one of the great geysers of Yellowstone. Its intervals vary from 9 to 15 hours but the short term average is usually stable enough that eruption times can be predicted. 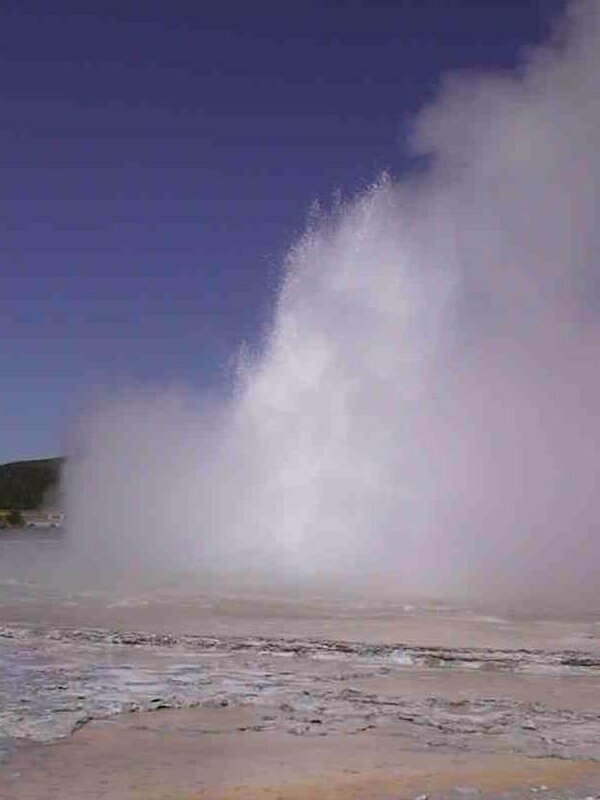 Great Fountain Geyser's eruption consists of a series of bursts (up to seven!) followed by quiet periods. This pattern continues for the duration of the eruption. Usually, but not always, the first burst is the tallest and strongest. About 70-100 minutes before an eruption, water overflows from the geyser's vent. About a half hour later, small bubbles appear along one edge of the pool. The boiling becomes more violent until the bubbles are 3 feet (1 m) tall. This is the start of the eruption. Before the high blasts begin, there may be a pause when the pool becomes still and quiet. A large steam bubble may rise and expand, causing the entire surface of the geyser's pool to dome upwards. Once the steam reaches the surface, the water explodes outward and upward.